The 13-year-old, 375-pound tiger died at a California wildlife preserve. Thriller, the tiger that belonged to Michael Jackson when the entertainer lived at Neverland, died of lung cancer. Thriller, a tiger that belonged to Michael Jackson when the entertainer lived at his Neverland ranch, has died of lung cancer at actress-activist Tippi Hedren's wildlife preserve in California. 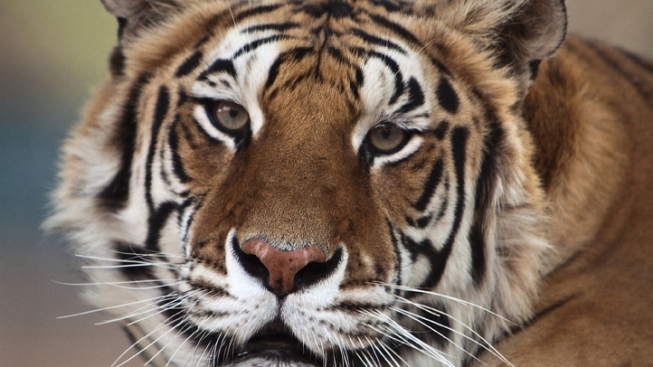 The 13-year-old, 375-pound (170-kilogram) tiger died June 11, Hedren said Wednesday. A necropsy was performed and the tiger was cremated. Staff workers will hold a private service when the ashes are buried in a section of the preserve set aside for animals that die there. Thriller and her brother Sabu were born on Nov. 20, 1998, and lived with Jackson until May 4, 2006, Hedren said. When Jackson left Neverland for good, his veterinarian asked Hedren to take the cats at her Shambala Preserve in Acton, about 50 miles (80 kilometers) north of Los Angeles. Other Neverland animals, including giraffes, flamingos, orangutans, elephants and dozens of reptiles, were sent to other sanctuaries in other parts of the country. Shambala didn't have a lot of room, but Hedren built a $79,000 habitat next to the preserve's lake and there were trees and a hill and Thriller had a great life with Sabu, she said. "Thriller was a real piece of work, one gutsy girl. She ruled Sabu's life. It was humorous to watch the whole relationship. She did things to him that male tigers would normally never allow. She would steal food from him. That's unheard of. She ruled the roost, was very independent and tough," Hedren said. Unlike many of the animals at the preserve, Thriller and Sabu arrived at the compound in excellent health physically and emotionally, Hedren said. There are 15 tigers at the compound, but Sabu is now alone in the habitat he shared with Thriller and he'll probably stay that way, Hedren said. Tigers are loners in the wild, she explained. Because Thriller was a famous tiger, she was very popular with visitors and media, Hedren said. "She didn't care. She was not a diva and didn't mug for the camera. We all loved her for it." Staff was trying to cope with Thriller's death, Hedren said. "It's very hard for all of us when these animals go away. Fortunately for Sabu and Thriller, they came in healthy and content. They had no problem with being in quarantine for 30 days. They adjusted so well." Most of the animals at Shambala, which requires $75,000 in donations every month to stay open, have trouble adjusting because they have such abusive pasts, Hedren said. Jackson, who died in 2009, often talked about his love of animals, but he never called to check on the tigers and he never sent any money to help pay for their care, Hedren said. A year after the tigers arrived, Hedren said staff sent a package of photos of Sabu and Thriller and T-shirts and other memorabilia to Jackson's children, "but we never heard a word back. I just think it's odd." A call to a spokesman for Jackson's estate was not immediately returned. The estate did not exist when the animals were transferred.